With the summer approaching, what do the words Garden Opera mean to you? An expensive evening at the opera, most probably in the original language with sur-titles, at some exclusive country venue? There is another meaning to those words. The Garden Opera Company endearingly contradicts most expectations of `country house’ opera. Every summer Garden Opera takes a professional main repertoire opera production on a tour of 50-60 venues in the UK, reaching parts of the country other opera companies never reach. It undertakes a short winter tour too, and for the last three years it has travelled to Kenya as well. No opera had ever been seen in Kenya until Garden Opera caused something of a sensation there in February 2004 with its production of Carmen. Last year they returned there with Don Giovanni and this March their third tour introduced sub-saharan East Africa to bel canto with their acclaimed 2005 production of Rossini’s Cinderella. Every performance received a standing ovation. Since Garden Opera’s modest beginnings in 1994, with two performances of The Marriage of Figaro for some neighbours by a group of students in a Somerset garden, the number of performances has grown annually and last year reached 60. The impetus has come from Peter Bridges, a remarkable solo pianist with a passionate enthusiasm for and wide experience in music theatre and education, who joined the company as Music Director in 1996, the same year as their costume designer Dulcie Best. Both are still with the company, as is Martin Lloyd-Evans, well known for his trenchant productions for (e.g.) Guildhall, ETO, Mid-Wales and Holland Park, who has directed every Garden Opera show since 1998. Bridges insists that Garden Opera is as much a genre as a company. His aim is to challenge opera’s elitist and intimidating image and bring accessible opera – evening and matinée – performances to audiences who might otherwise not expect or want to go to an opera. The exhaustive and exhausting summer tour goes all over England and Wales, from Cornwall to Shropshire via Pembrokeshire and Norfolk and also includes several London venues such as the Green at Richmond, the Nannies’ Lawn in Regents Park and the charmingly overgrown Observatory Garden in Greenwich. All performances are in English, with the recitative replaced by spoken dialogue specially devised and tailored by Lloyd-Evans to suit production, performers and audience. The small stage, measuring about twenty square metres, is set up in the venue on the day of performance and the accompanying band is on one side of the stage, so there is no barrier (or pit) between the audience and the performers – part of the ethos of the company is the audience’s intimate involvement with the performance. It is impossible not to be drawn into a Garden Opera performance, as the style, though formal enough, is utterly direct and unfussy; professional standards are always high; doing fifty performances of a repertoire opera gives a perfect opportunity for voices of the future to cut their operatic teeth: Garden Opera offers as challenging a performance situation as any other company. The six-piece band, led from the keyboard by Bridges, makes the accompaniment, and indeed the whole performance, more like chamber music than grand opera. The piano gives the backbone to a re-orchestration for two violins, cello, clarinet (doubling piccolo and flute) and trumpet (doubling with the less strident flugelhorn). The skilful arrangers are Bridges himself and the resident wind player Bernard Lafontaine. It works a treat, and though sound enhancement is of course essential in the open air, what Garden Opera’s sound engineers produce is the best I’ve ever heard in an outdoor venue. Indeed, as long as you go along without delusions of grandeur, it is easy to enjoy yourself without thinking that the opera is a cut-down version, amplified and in English. When describing the company, Bridges mentions the inspiration of Lorca’s theatre group La Barraca, which toured Spain in the 1930s giving adaptations of the classic Spanish repertoire plays as well as Lorca’s own works. The performances took place in a wide variety of venues from barns to bull rings and were adapted to communicate to the local people, many of who had never seen a play before. Though most Garden Opera performances now take place in gardens, Bridges aims to create productions that will work in an ever-wider range of city and country out- and indoor venues; from country houses to village halls and public parks to school playgrounds and to attract and retain yet more first-time opera goers. Bridges also talks with obvious affection for the communities the Company has built links with here and abroad – it now returns annually to a great many venues. Performances are either arranged by the company themselves or hosted by local organisations, e.g. schools, hotels, clubs, gardens of private homes both stately and modest, who buy in a performance and administer it themselves. In small communities all over England and Wales the annual visit by Garden Opera has become a traditional and eagerly anticipated event involving large numbers of local volunteers. Accommodation and company meals are provided by hosts who also advertise and organise the whole event; first-time hosts and the large numbers of volunteers are always mentored by the small but dedicated administrative staff of Garden Opera. Overheads are kept to the minimum and all profits go to charity. Since 2000 Garden Opera has sold 82,000 tickets and enabled £335,000 to be raised for national and local charities – Macmillan Cancer Relief Fund, The National Kidney Research Trust, Dyslexia Research Trust and Hereford Cathedral Perpetual Trust are but a few of the beneficiaries. All the profits from the performances Garden Opera organize themselves goes into their education work, and this is another vitally important aspect of Garden Opera’s raison d’être. Members of the company take opera workshops into schools and introduce them gently to the genre, and several performances include participation by local children who come up onto the stage from the audience to sing a chorus – choruses otherwise being neatly `avoided’ in the Garden Opera versions. In Cinderella, the chorus who arrive to invite the figlie amabili di Don Magnifico to Prince Ramiro’s ball was performed by local children who delivered their own handmade ball invitations to the audience before being led by Alidoro in a spirited rendition of the courtiers’ chorus. Garden Opera keeps its ticket prices low, though they have recently and reluctantly topped £20. Until now they have never applied for any grant or subsidy and break even thanks to ticket sales and generous sponsors and private donors. If it is a non-profit organisation, it is because all the profit goes to charity. And if you haven’t heard about Garden Opera before, it’s perhaps because, with a secure infrastructure and a faithful audience, they don’t need to flaunt themselves; but their contribution to the operatic life of this country – and in Kenya – is beyond measure. Last year Garden Opera commissioned me to translate La Cenerentola and I was offered the chance to travel with the company on their third trip to Kenya. I had heard extraordinary accounts of performances to thousands of schoolchildren, not to mention the odd giraffe, and so I was curious to witness this remarkable phenomenon myself. In the autumn of 2003 the company went to Spain to perform Carmen at the Jimena Festival in Andalucia; in a typically eccentric and original move, they integrated a flamenco group into their performances. The invitation had come from Lis Woods, a redoubtable English businesswoman and music enthusiast living in Spain, who chairs the charity she founded, the Kijani Kenya Trust, to raise funds for health care, including HIV/AIDS, and Conservation in Kenya (Kijani is a Swahili word meaning `green shoots’). Being a woman prepared to take risks with a `nothing venture, nothing gain’ attitude (and an ability to handle two ringing mobile phones while driving a 4WD) Woods invited Garden Opera to take part in the first Kijani International Music Festival in Kenya in 2004. Carmen took Kenya by storm and Garden Opera returned for another tour, of Don Giovanni, last year. No one had seen Don Giovanni at Hell’s Gate (at Lake Naivasha) before! On 28 February this year the company left Heathrow with a reduced luggage allowance to cater for the twenty or so assembled trunks and boxes of props and costumes for the show, including Cinderella’s kitchen sink. The tour encompassed four full-length opera performances, preparing three large choruses of schoolchildren to take part in the opera, two evening concerts, an education project and master classes as well as wonderful hospitality in comfortable hotels and various wildlife visits, including the opportunity to adopt a baby elephant; so some company members became parents. Though based in Nairobi, the group drove north to Laikipia, the province west of Mount Kenya, to perform in the wilds of the bush on the equator, and also flew to perform at Fort Jesus, the wonderfully crumbly 400-year-old Portuguese fort in Mombasa on the east coast. The Nairobi performances took place in the garden of the recently restored forester’s house at the 45 acre Arboretum established in 1907 adjacent to State House, the President’s residence. On the day of the first performance there it had just rained for the first time this year and wild lilies had literally sprung into flower all over the lawns. There was a spot of bother with rain, which was rumoured to be arriving early this year. Alas this later proved to be wishful thinking in concern for the dreadful drought in the country, but as some of the company prepared to take part in the opening concert of the Festival in Nairobi’s All Saints Cathedral – a confluence of Kenyan music and the Mozart Requiem – the heavens opened upon a vast arriving audience, including the British High Commissioner, Adam Wood. And the night before the Cinderella performance at Ol Pejeta, out in the bush, the specially erected camp the company had just arrived to stay at was literally washed away by four inches of water that fell in as few hours. All that was left was a bedraggled bunch of musicians and several crates of Tusker, Kenya’s beer. Undaunted, all were moved to the luxury of the famous Sweetwaters Tented Cap and the performance went ahead as planned the next afternoon, the specially built road to the venue having been hastily repaired. The words of the act I finale `But I have a dreadful feeling that an awesome storm is brewing’ came true as black clouds appeared accompanied by thunder claps, but, as at all the other shows, the sky remained dry. The information minister, Mutahi Kagwe, thanking the company publicly, said he had seen opera in London and Berlin but it was easier to understand it without having to look at a board above the stage. Peter Bridges and Martin Lloyd-Evans had arrived in Nairobi the previous week for a four-day workshop with drama and music students at Kenyatta University; together they devised a 15-minute entertainment about the social repercussions of living with HIV/AIDS which was performed as a curtain-raiser to the two central Cinderella performances of the tour in the Nairobi Arboretum. This vivid entertainment, in which nine heart-rending cameo dialogues were starkly contrasted with a lively choral refrain, showed the students to be instinctive natural performers, whether singing, dancing, acting or playing guitars, violins, wind and a bewildering variety of African percussion instruments. The six band players spent a morning at the conservatory and gave master classes; despite discovering that the trumpet professor there is self-taught and that a violinist is teaching the cello (no cello teacher in Kenya), they found the enthusiasm and hunger to learn overwhelming. The Kijani Festival could not, of course, go ahead without sponsorship, and Lis Woods generates a remarkable level of goodwill and generosity among the great and good in Kenya for her impressive array of charitable projects. Most of the money raised by Carmen and the 2005 festival (9 million Kenyan shillings, c.£430,000) is supporting a new centre for the counselling and care of children with HIV/AIDS at a lovely old-fashioned cottage hospital in Nanyuki. Safaricom, Kenya’s leading mobile phone network, are at the forefront of the impressive roster of sponsors of the Festival. 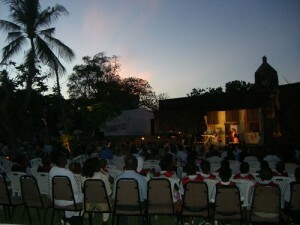 After the final performance of Cinderella under a balmy midnight sky in the utterly beautiful courtyard of Fort Jesus, Safaricom’s chief financial officer Les Baillie announced that they have agreed to support East Africa’s biggest arts project ever, the building of an amphitheatre in the Arboretum garden in Nairobi. It will be available for all kinds of performance and the profits will go to the Kijani Trust. And for the first time, the nomadic Garden Opera will perform on a permanent stage, maybe a metaphor for the niche it has established at the heart of one of most shatteringly beautiful and needy countries in the world.